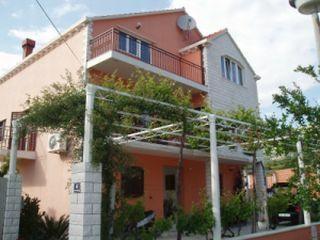 "Seka" is a newly built and modern holiday home about 800 m from the beach. The vacation houses have 2 studio apartments . Both apartments are fully air-conditioned with kitchen and dining area, separate bedrooms with double beds, SAT/TV, shower/WC and balcony complete with table and chairs . The house is maintained extremely well. The price for the accommodation includes towels, bed linen without beach sheets, a completely furnished kitchen with all necessary crockery and cutlery, the consumption of electricity and water as well as the final cleaning. A grill is also at your disposal. There is also a house-owned parking place. Shopping facilities are within easy walking distance (200 metres). Only 700 m from the house there are several restaurants, shops and boutiques. The historical centre of Dubrovnik can be reached extremely well with public transports (bus) on streets in an excellent condition. Mr. Barac would be happy to arrange an excursion to Medugorje and Mostar for you. Mr. Barac will pick you up whether you arrive by plane, on a ship or bus and will drive you back on your departure day. A family atmosphere with Dalmatian hospitality and warmth awaits you and your children. Apartments are fully air-conditioned with kitchen and dining area, separate bedrooms with double beds, SAT/TV, shower/WC and balcony complete with table and chairs.